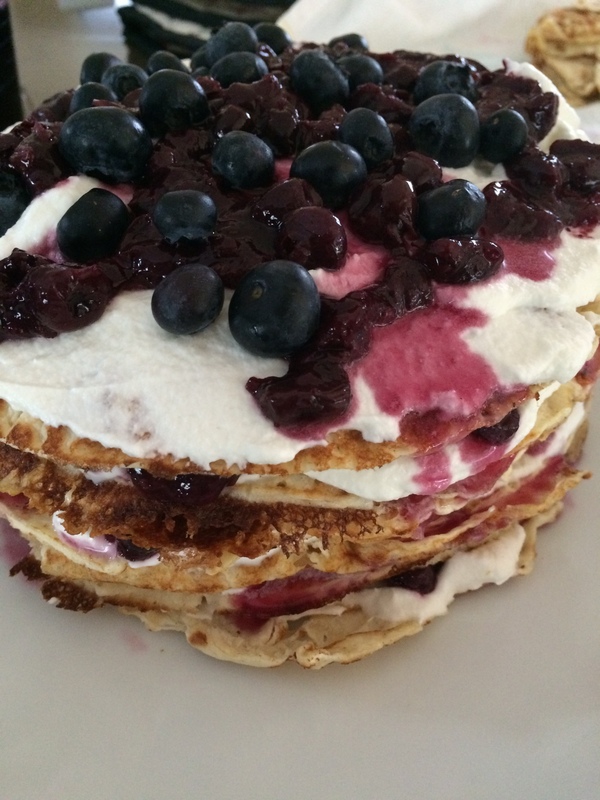 Blueberry and Cointreau Cream Brunch Stack Cake – IKEA recipe hack – Odds & Hens : Ramblings. Creations. 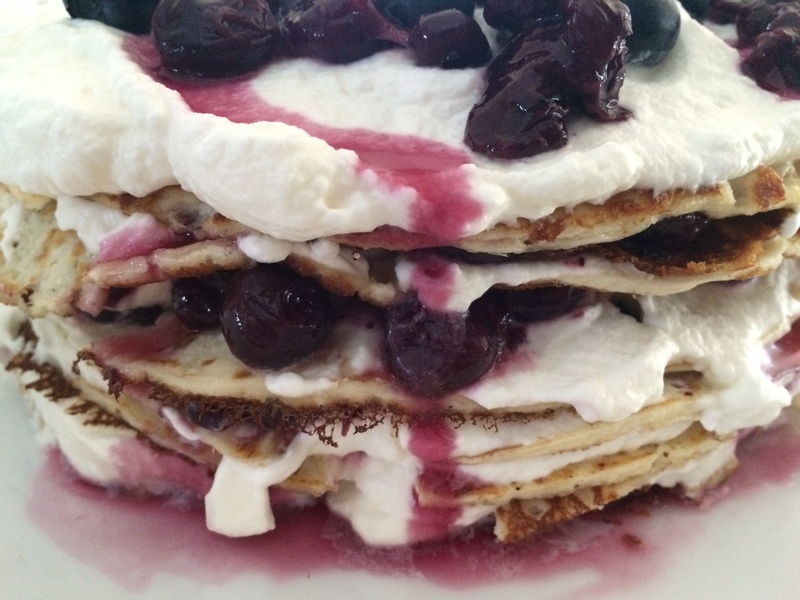 Stack cakes – yum. Oft made with fresh crepes or grandma’s secret pancake recipe. 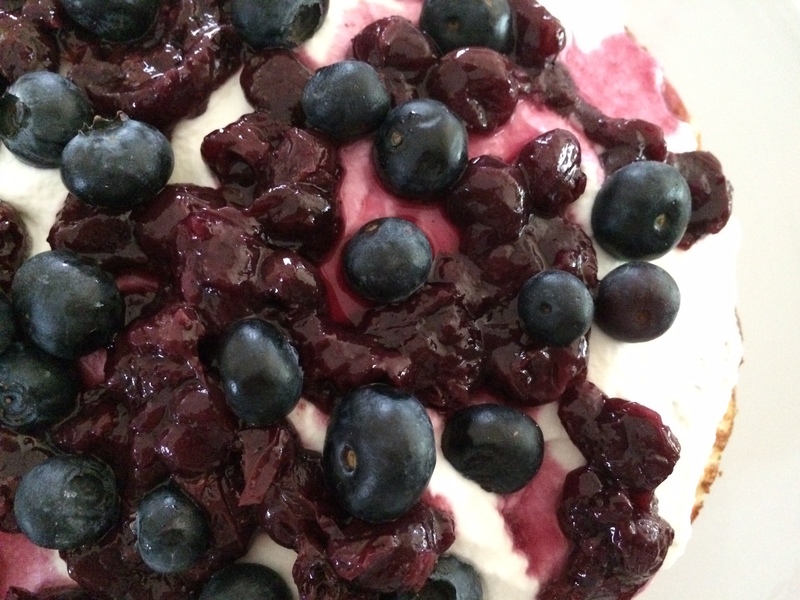 Today I present my quick version featuring pannkakor (swedish pancakes) from IKEA with home-canned organic free range blueberry filing and cointreau whipped cream. Fruit and cream stack cakes are great for a special brunch or dessert at anytime of day (remember life is short). You can amp up the sweetness by using a more jammy or compote-y filling or by whipping up the cream, folding in mascarpone or yogurt/creme fraiche and additional sugar. I didn’t really measure and you shouldn’t either, just have fun. 3 tablespoons plus or minus or not at all Cointreau, rum etc. Defrost the pannkakor. The IKEA ones are folded into quarters. This makes them fragile and likely to tear along the seams but that is not a problem in this recipe. Prep the fruit filling. As you can tell by the noncommittal ingredient list, there isn’t a wrong answer. You could use pie filling, mashed berries, make a compote quickly by heating mashed berries with a little water and sugar (here is a nice tutorial), use jam, syrup etc. Any combination and you can chose how sweet. I am trying to use up some items in the pantry in prep for this seasons canning so it was blueberries in simple syrup for me. In a large mixing bowl add the liquor and sugar to the whipping cream. Stir and taste, add more sugar at this point if you want. Using your mixer (because doing by hand defeats the WHOLE point of using frozen crepes) on high speed whip up the whipping/heavy cream until steep peaks form. Start stacking! 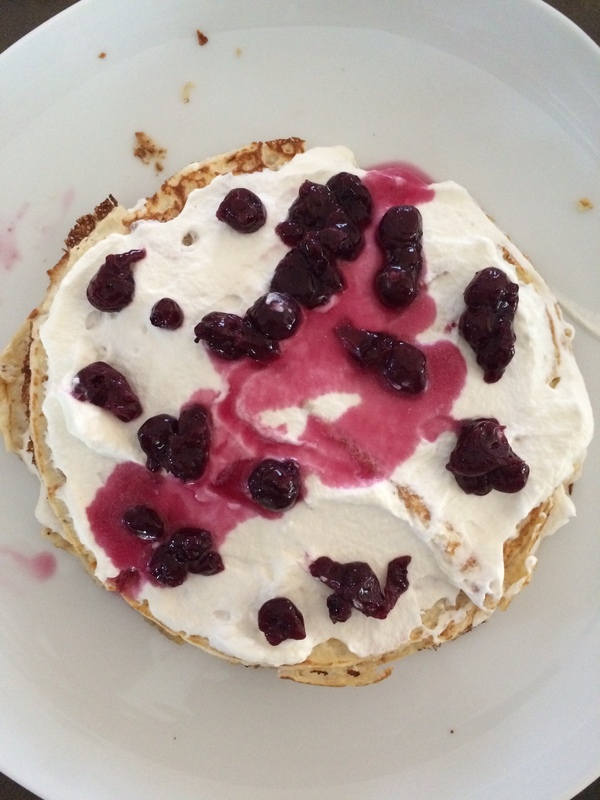 place the first pancake down on a plate, spread with whipped cream add fruit and layer on the next pancake. Now, I tried to rotate so that the seams didn’t line up, especially the broken ones. Just keep on spreading and repeating. A few layers just had cream in them. Be sure to leave enough whipped cream and fruit for the top show layer. Here is where you can add citrus zest, dusting of powder sugar or cocoa, mint or basil leaves (strawberry basil?) etc. It is best to serve relatively soon after you make it but if you need to make ahead, do all the layers except the top. Save that for right before serving. Slice with a big knife and soak up the oohs and aahs. I would love to hear your Ikea food hacks – please share.